The way Principal Michael Hernandez tells it, something had to go. Hernandez decided that at Sherman Middle School, it will be French class. With a renewed emphasis on curriculum basics in the Madison School District, the need at Sherman to double-down on math skills, and a scheduled expansion there of the AVID program that prepares low-income minority kids for college, Hernandez figures the north-side middle school will need to drop its second “world language” offering next year. French 2 will continue for seventh-graders who took French 1 this year. The school’s Spanish-language program — including three sections of dual-language instruction — also will continue. Principals will be developing these kinds of adjustments around the margins to prepare for the 2013-2014 school year as district officials begin work on the budget and schools get projections on how many staff members they will have. School Board members on Monday will receive a “budget briefing” instead of fleshed-out budget proposal. Penciled in is $392,807,993 in district-wide spending next school year, down a fraction from this year. The scaled-down budget proposal is due to the uncertain prospects of a controversial proposal in Gov. Scott Walker’s budget to shift aid and expand vouchers to Madison and eight other school districts — at a projected cost of more than $800,000 to the Madison public schools. In addition, new Superintendent Jennifer Cheatham just came on the job three weeks ago and is not prepared yet to present a detailed budget. The Madison School District is betting that restorative justice practices — giving people in conflict the opportunity to hear each other’s side of the story in an attempt to heal a rift — are a powerful tool in making schools safer, more productive places. Following a two-year pilot project at La Follette High School and Black Hawk and Sennett middle schools, the district has entered into an agreement with the YWCA Madison to extend the program to East High School as well as Sherman, O’Keeffe, and Whitehorse middle schools. The school district has allocated $164,420 for payment to YWCA, which trains staff and helps run restorative practice circles, and made restorative practices part of its plan to close the achievement gap between students of color and white students. To hear the students at Sennett Middle School tell it, restorative practices hold a lot of potential for helping students do better in school and for building more positive relationships. She knows that art also has the power to break down cultural barriers and stereotypes, inspire creativity, and foster community. With Africa Connects!, a K-12 art history and service-learning project in Madison, Curtis puts that idea into practice. Children from Sherman Middle School take notes while viewing African art and beaded works on exhibit at the Chazen Museum of Art. The group is participating in a grant-funded project — called “Africa Connects!” — led by volunteer coordinator Susan Curtis (background at right) and offered through the Madison Metropolitan School District. With help from the Chazen Museum of Art and others in the community, Curtis worked to forge a partnership between local schools that opened the door for high school and middle school students to learn more about African art. Background information -The Purpose of this Proposal: Research shows that half of all lifetime cases of mental illness begin by age 14.1 Scientists are discovering that changes in the body leading to mental illness may start much earlier, before any symptoms appear. Helping young children and their parents manage difficulties early in life may prevent the development of disorders. Once mental illness develops, it becomes a regular part of a child’s behavior and more difficult to treat. Even though doctors know how to treat (though not yet cure) many disorders, a majority of children with mental illnesses are not getting treatment (National Institute of Mental Health). Current Status: Currently, there is one program housed at Hoyt that serves 28-30 students in self contained settings. There is currently a ratio of 1:4 with 4 staff and 4 special educational assistants assigned to the program. In addition, there is a Cluster Program housed at Sherman with 2 adults and 6-7 students in the program. Proposal: This proposal leaves approximately half of the students and staff at the current Hoyt site (those students who pose more of a danger to self or others) and removes all of the students and staff from Sherman (no program at Sherman) to the new sites. Students will attend either Whitehorse or Cherokee Middle Schools with a program that provides ongoing professional help and is more inclusive as students will be assigned to homerooms and classes, with alternative settings in the school to support them when they need a more restrictive environment with support from a smaller student ratio and a psychologist or social worker that is assigned to the team. This initiative was discussed during Monday evening’s Madison School Board meeting. Watch the discussion here (beginning at 180 minutes). District administration, along with school leadership and school staff; have examined the research that shows thatfundamental change in education can only be accomplished by creating the opportunity for teachers to talk with one another regarding their instructional practice. The central theme and approach for REaL has heen to improve and enhance instructional practice through collaboration in order to increase student achievement. Special attention has been paid to ensure the work is done in a cross – district, interdepartmental and collaborative manner. Central to the work, are district and school based discussions focused on what skills and knowledge students need to know and be able to do, in order to be prepared for post-secondary education and work. Systemized discussions regarding curriculum aligmnent, course offerings, assessment systems, behavioral expectations and 21 st century skills are occurring across all four high schools and at the district level. Since March of 2010, MMSD district and school staff has completed the following work to move the goals of the REaL Grant forward. Specific accomplishments aligning to REaL grant goals are listed below. Accomplishment I: Completed year 2 of professional development for Department Chairpersons to become instructional leaders. The work will continue this summer with the first ever Department Chairperson and Assistant Principal Summer Institute to focus on leading and fostering teacher collaboration in order to improve student achievement. impact of effective implementation the EP AS system in order to ensure successful implementation within MMSD. Accomplishment 3: Piloted the implementation of the EXPLORE test at Memorial, Sherman and with 9th grade AVID students at all four comprehensive high schools. Accomplishment 4: This summer, in partnership with Monona Grove High School and Association of Wisconsin School Administrators (AWSA), MMSD will host the Aligned by Design: Aligning High School and Middle School English, Science, Math and Social Studies Courses to College/Career Readiness Skills. To be attended by teams of MMSD high school and middle school staff in July of 2010. Accomplishment 5: Continued focused planning and development of a master communication system for the possible implementation of early release Professional Collaboration Time at MMSD High Schools. Schools have developed plans for effective teaming structures and accountability measures. Accomplishment 6: District English leadership team developed recommendations for essential understandings in the areas of reading, writing, speaking and listening for 9th and 10th grades. Following this successful model, similar work will occur in Math, Science and Social studies. Related: Small Learning Community and English 10. Bruce King, who evaluated the West High’s English 9 (one English class for all students) approach offers observations on the REal program beginning on page 20 of the PDF file. Test early, test often, and make sure the results you get are meaningful to students, teachers and parents. Although that may sound simple, in the last three years it’s become a mantra in the Monona Grove School District that’s helping all middle and high school students increase their skills, whether they’re heading to college or a career. The program, based on using ACT-related tests, is helping to establish the suburban Dane County district as a leader in educational innovation in Wisconsin. In fact, Monona Grove recently hosted a half-day session for administrators and board members from Milwaukee and Madison who were interested in learning more about Monona Grove’s experiences and how the school community is responding to the program. In a pilot program this spring in Madison, students in eighth grade at Sherman Middle School will take ACT’s Explore test for younger students. At Memorial, freshmen will take the Explore test. Known primarily as a college entrance examination, ACT Inc. also provides a battery of other tests for younger students. Monona Grove is using these tests — the Explore tests for grades 8 and 9, and the Plan tests for grades 10 and 11 — to paint an annual picture of each student’s academic skills and what he or she needs to focus on to be ready to take on the challenges of post-secondary education or the work force. The tests are given midway through the first semester, and results are ready a month later. “We’re very, very interested in what Monona Grove is doing,” says Pam Nash, assistant superintendent for secondary education for the Madison district. “We’ve heard our state is looking at ACT as a possible replacement for the WKCE (Wisconsin Knowledge and Concepts Exam), and the intrinsic reliability of the ACT is well known. The WKCE is so unrelated to the students. The scores come in so late, it’s not useful. The Madison School District’s “Value Added Assessment” program uses data from the oft-criticized WKCE. Hello, my name is James Howard. At the same, I understand the importance of maintaining fiscal responsibility to taxpayers. As an economist with over 35 years of experience I know it is critical to analyze and evaluate the economic impact of decisions. Today James Howard officially announced his candidacy for the Madison Metropolitan School District Board of Education. Mr. Howard is a candidate for Seat 4 which is currently held by retiring Board member Johnny Winston, Jr.
Mr. Howard, an economist and scientist at the Forest Products Laboratory, has been active in education and community matters for many years. He served on the MMSD Strategic Planning Committee, the East Attendance Area Demographics and Long Range Facility Needs Task Force, and was co-chair of Community and Schools Together (CAST), the school referendum support group. He has also served on the South Madison Economic Development Committee and the Town of Madison Economic Development Committee. In making this announcement, Mr. Howard thanked Mr. Winston for his many years of dedicated public service to Madison’s children and community. “Mr. Johnny Winston, Jr. has been a leader on the board and in our Madison community. It will be a challenge for any newly elected board member to maintain the high standards that he exemplified,” said Mr. Howard. Mr. Howard has identified as his Board priorities: ensuring high expectations for all students, raising educational standards; narrowing the achievement gap; basing school curriculum, wellness and safety decisions on research; ensuring fiscal responsibility to taxpayers; improving communication between teachers, parents, district administrators and the community; and improving state funding of public schools. He and his wife, Kathryn, have three children. His adult daughter is a UW Madison senior studying abroad in Kenya, his son attends Sherman Middle School, and his youngest daughter attends Emerson elementary. Budget/Financing, College Preparation, Community Partners, Curriculum, Elections, Events, Governance/Board Decision Making, History - Madison Schools, Lifelong Learning, School Climate, Staff Support, Student Support, Teacher Support, What Can I Do? Notes and Links: President Obama and Education Secretary Arne Duncan Visit Madison’s Wright Middle School (one of two Charter Schools in Madison). President Barack Obama and Education Secretary Arne Duncan will visit Madison’s Wright Middle School Wednesday, November 4, 2009, purportedly to give an education speech. 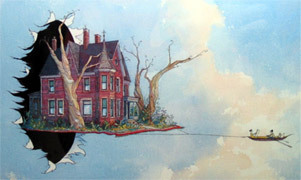 The visit may also be related to the 2010 Wisconsin Governor’s race. The Democrat party currently (as of 11/1/2009) has no major announced candidate. Wednesday’s event may include a formal candidacy announcement by Milwaukee Mayor, and former gubernatorial candidate Tom Barrett. UPDATE: Alexander Russo writes that the visit is indeed about Barrett and possible legislation to give the Milwaukee Mayor control of the schools. Wright Principal Nancy Evans will surely attend. Former Principal Ed Holmes may attend as well. Holmes, currently Principal at West High has presided over a number of controversial iniatives, including the “Small Learning Community” implementation and several curriculum reduction initiatives (more here). I’m certain that a number of local politicians will not miss the opportunity to be seen with the President. Retiring Democrat Governor Jim Doyle, Wisconsin Department of Public Instruction Superintendent Tony Evers, Dane County Executive Kathleen Falk (Falk has run for Governor and Attorney General in the past) and Madison School Superintendent Dan Nerad are likely to be part of the event. Senator Russ Feingold’s seat is on the fall, 2010 ballot so I would not be surprised to see him at Wright Middle School as well. Madison, still, has only two charter schools for its 24,295 students: Wright and Nuestro Mundo. The Madison Board of Education rarely rejects the recommendations of Superintendent Rainwater. I recall only two times that we have explicitly rejected his views. One was the vote to authorize Nuestro Mundo Community School as a charter school. The other was when we gave the go-ahead for a new Wexford Ridge Community Center on the campus of Memorial High School. Here’s how things happen when the superintendent opposes the Board’s proposed action. The local school District Administration (and Teacher’s Union) intransigence on charter schools is illustrated by the death of two recent community charter initiatives: The Studio School and a proposed Nuestro Mundo Middle School. Those interested in a quick look at the state of Madison’s public schools should review Superintendent Dan Nerad’s proposed District performance measures. This document presents a wide variety of metrics on the District’s current performance, from advanced course “participation” to the percentage of students earning a “C” in all courses and suspension rates, among others. Lift caps on charter schools. This wonderful opportunity for Wright’s students will, perhaps be most interesting for the ramifications it may have on the adults in attendance. Ripon Superintendent Richard Zimman recent Rotary speech alluded to school district’s conflicting emphasis on “adult employment” vs education. Wisconsin teachers couldn’t be fired over test scores. UPDATE: How Do Students at Wright Compare to Their Peers at Other MMSD Middle Schools? Alexandria Superintendent Morton Sherman was less than a week into the job, greeting parents outside an elementary school, when he was first asked how he planned to fix the middle schools. Last night came his answer: through a massive overhaul. Sherman, seven months into his tenure, presented a plan for restructuring the city’s two middle schools, which have never met federal benchmarks and which, he said, contribute to Alexandria’s dropout rate being among the highest in the area. Locally and across the nation, middle schools have generally been regarded as the problem child for school systems, marking the turbulent teenage years in which test scores and enthusiasm drop. In response, school systems have begun getting creative and investing more resources into those grade levels. The District school system, for example, has a program that pays students for their performance, and Montgomery County schools have committed to a three-year, $10 million plan to accelerate curriculum, train teachers and improve the leadership structure. Sherman’s plan, which he presented to the Alexandria School Board last night, calls for splitting the two middle schools into five smaller ones, each with its own principal and staff. The change would not cost the school system more, he said, adding that staff would be reallocated. If the board approves the plan, the new structure will be in place in time for the next school year. Sherman, wisely, has a blog, including comments! The number of Wisconsin schools that didn’t meet standards set by the federal No Child Left Behind Act and could face sanctions increased from 95 to 156 this year, including the entire Madison Metropolitan School District. Of the 156 schools on the list released Tuesday by the state Department of Public Instruction, 82 were in the Milwaukee Public School district. Seven of the schools on the list were charter schools. Besides individual schools on the list, four entire districts made the list for not meeting the standards. That lists includes the school districts of Beloit, Madison, Milwaukee and Racine. Superintendent Art Rainwater told The Capital Times the list is “ludicrous,” the district doesn’t pay attention to it, and the district will do what’s best for the students and not gear curriculum to meet the criteria set by the federal government. NCLB’s biggest problem is that it’s designed to help Washington politicians appear all things to all people. To look tough on bad schools, it requires states to establish standards and tests in reading, math and science, and it requires all schools to make annual progress toward 100% reading and math proficiency by 2014. To preserve local control, however, it allows states to set their own standards, “adequate yearly progress” goals, and definitions of proficiency. As a result, states have set low standards, enabling politicians to declare victory amid rising test scores without taking any truly substantive action. Madison’s Leopold and Lincoln elementary schools were among the list of schools failing to attain the standards, marking the first time that a Madison elementary school made the list. Three Madison middle schools — Sherman, Cherokee and Toki — also joined the list, which continued to include the district’s four major high schools: East, West, La Follette and Memorial. Madison’s Black Hawk Middle School, which was on the list last year, made enough academic progress to be removed from it. Listen to the discussion [47MB MP3 Audio]. The high school positions are designed to help students with behavior, academic, social, transitional and other problems who can hurt themselves and the learning environment, Memorial High School Principal Bruce Dahmen said. “This is not only important but critical to the future of our schools,” Superintendent Art Rainwater said as he recommended an initial proposal to spend $720,500 for security measures. The money is available through the recently signed state budget, a windfall Madison schools did not know they would get when the Board inked the final budget in October. The board approved hiring four case managers at East, West, Memorial and La Follette and five positive behavior coaches will be brought on board at O’Keeffe, Sherman, Jefferson, Black Hawk and Whitehorse middle schools. At last night’s candidate forum at the Warner Park neighborhood center, Winston was the only candidate who said he’d vote yes to closing schools. He proudly listed his connections to the Northside, while missing the irony of being the only one who would close the Northside’s Sherman Middle School. Curriculum, Elections, Governance/Board Decision Making, Student Support, What Can I Do? Curriculum, Events, Governance/Board Decision Making, School Climate, What Can I Do? Unlike other assessments, MAP measures both student performance and growth through administering the test in both fall and spring. No matter where a student starts, MAP allows us to measure how effective that student’s school environment was in moving that student forward academically. This fall’s administration serves as a baseline for that fall to spring growth measure. It also serves as an indicator for teachers. As we continue professional development around MAP, we will work to equip schools to use this data at the classroom and individual student level. In other words, at its fullest use, a teacher could look at MAP data and make adjustments for the classroom or individual students based on where that year’s class is in the fall, according to these results. Meeting growth targets on the fall administration indicates that a student met or exceeded typical growth from Fall 2011 to Fall 2012. Typical growth is based on a student’s grade and prior score; students whose scores are lower relative to their grade level are expected to grow more than students whose scores are higher relative to their grade level. In Reading, more than 50% of students in every grade met their growth targets from Fall 2011 to Fall 2012. 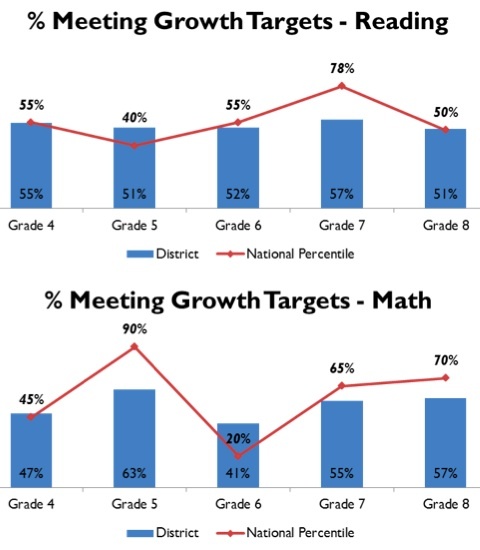 In Mathematics, between 41% and 63% of students at each grade level met their growth targets. The highest growth in Mathematics occurred from fourth to fifth grade (63%) and the lowest growth occurred from fifth to sixth grade (41%). It is important to note that across student groups, the percent of students making expected growth is relatively consistent. Each student’s growth target is based on his or her performance on previous administrations of MAP. The fact that percent of students making expected growth is consistent across student subgroups indicates that if that trend continues, gaps would close over time. In some cases, a higher percentage of minority students reached their growth targets relative to white students. 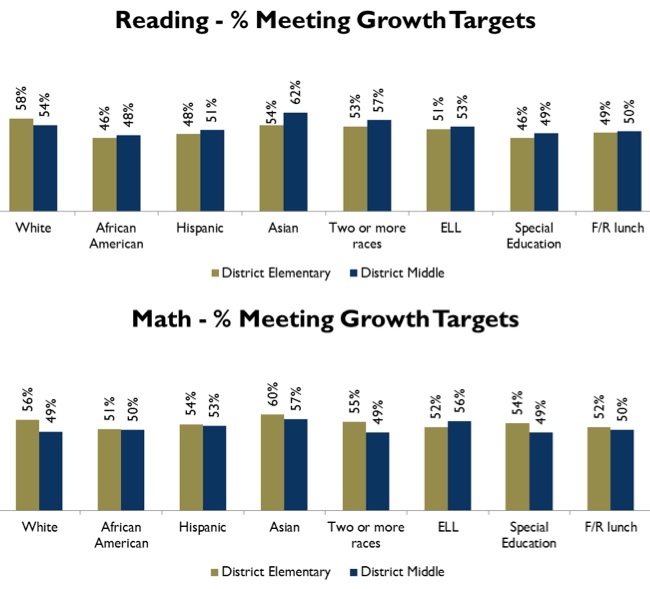 For example, at the middle school level, 49% of white students met growth targets, but 50% of African American students and 53% of Hispanic students met their growth targets. In addition, English Language Learners, special education students, and students receiving free and reduced lunch grew at similar rates to their peers. MAP also provides status benchmarks that reflect the new, more rigorous NAEP standards. Meeting status benchmarks indicates that a student would be expected to score “Proficient” or “Advanced” on the next administration of the Wisconsin Knowledge and Concepts Examination (WKCE). That means that even though overall scores haven’t changed dramatically from last year, the percent of students identified as proficient or advanced will look different with these benchmarks. That is not unique for MMSD – schools around the state and nation are seeing this as they also work toward the common core. While these scores are different than what we have been used to, it is important to remember that higher standards are a good thing for our students, our districts and our community. It means holding ourselves to the standards of an increasingly challenging, fast-paced world and economy. States all around the country, including Wisconsin, are adopting these standards and aligning their work to them. As we align our work to the common core standards, student achievement will be measured using new, national standards. These are very high standards that will truly prepare our students to be competitive in a fast-paced global economy. At each grade level, between 32% and 37% of students met status benchmarks in Reading and between 36% and 44% met status benchmarks in Mathematics. Scores were highest for white students, followed by Asian students, students identified as two or more races, Hispanic students, and African-American students. These patterns are consistent across grades and subjects. Attachment #1 shows the percentage of students meeting status benchmarks and growth targets by grade, subgroup, and grade and subgroup. School- and student-level reports are produced by NWEA and used for internal planning purposes. I requested MAP results from suburban Madison Districts and have received Waunakee’s Student Assessment Results (4MB PDF) thus far. Madison’s Warner Park may be best known as home of the Madison Mallards baseball team, but it’s also home to real mallards and at least 99 other species of wild birds. Thanks to a group of outdoor-loving Sherman Middle School students working with University of Wisconsin-Madison student mentors, the list of wild birds that make the almost 200 acre urban park their home, or their temporary home as they migrate north and south, now stands at 100. The first week in April the Sherman birding club, which includes sixth-, seventh- and eighth-grade students partnered with UW students, discovered the landmark 100th species in the park. It’s a yellow-bellied sapsucker, a type of woodpecker, sighted with the help of nationally renowned ornithologist and author John C. Robinson. Robinson was visiting Madison to give a talk at the UW on conservation and outdoor recreation. Taxpayers got a chance to ask the questions Tuesday night about the upcoming multimillion dollar Madison school referendum. More than a dozen people turned out to Sherman Middle School for the first of four public hearings across the city. Superintendent Dan Nerad gave a brief presentation before opening the forum up for questions. Voters questioned everything from Fund 80 to the Capital Expansion Fund and student achievement. Active Citizens for Education said they would like to have seen the referendum scheduled for the spring in order to give the district time to re-evaluate programs that they say are not working – programs that could be cut or changed. Referendum supporters, Communities And Schools Together, know the $13 million referendum will be a tough sell, but worth it. School Board President Arlene Silveira was pleased with the dialogue and questions asked at the forum and said she hasn’t been overwhelmed with questions from constituents about the referendum. “It’s been fairly quiet, and I think it’s been overshadowed by the presidential election and (downturn with) the economy,” Silveira said. “People are very interested, but it does take an explanation. Superintendent Dan Nerad has already formulated a plan for program and service cuts in the 2009-2010 budget if voters do not pass the referendum. Those include increasing class sizes at elementary and high schools, trimming services for at-risk students, reducing high school support staff, decreasing special education staffing, and eliminating some maintenance projects. Nerad said outlining potential budget cuts by general categories as opposed to specific programs was the best route for the district at this juncture. Superintendent Art Rainwater will add a longtime Madison-area educator and a staff member new to the district to his Madison Metropolitan School District staff, pending approval at next week’s School Board meeting. Ann Yehle will assume the post of executive director of educational services and Erik Kass will take over as assistant superintendent for business services. If these major positions are approved by the Board, Yehle and Kass are expected to be named to the jobs May 5 and will begin their jobs July 1. Yehle, who currently works as an administrator in the Wisconsin Department of Public Instruction’s Division of Reading and Student Achievement, was the principal at Sherman Middle School for six years. Several joint committees were created in the recent negotiations over MTI’s 2014-15 Teacher Collective Bargaining Agreement. The joint committees will study and potentially recommend modification of Contract terms. Each committee will report its recommendations, if any, to Superintendent Cheatham and to the MTI Board of Directors. The Committee on Teacher Assignments will discuss potential modification of Contract Section IV-F, Teacher Assignments, Surplus, Vacancies and Transfers. MTI’s appointees are: Andy Mayhall (Thoreau), Nancy Roth (West), Karlton Porter (Cherokee) and Doug Keillor. The Committee on Teacher Evaluation will study and make recommendations pertaining to the District’s implementation of the State-mandated teacher evaluation system, “Educator Effectiveness”. Any revisions will be incorporated into Section IV-H of the Teacher Collective Bargaining Agreement and will become effective July 1, 2014. MTI’s appointees are: MTI President Peggy Coyne (Black Hawk), Andrew McCuaig (La Follette), Kerry Motoviloff (Doyle) and Sara Bringman. The Committee on Professional Collaboration Time will discuss implementation of the MTI/MMSD Memorandum of Understanding on High School & Middle School Professional Collaboration Time. MTI’s appointees are: Art Camosy (Memorial), Karen Vieth (Sennett), Aisha Robertson (West), and Nichole Von Haden (Sherman). The Committee on Elementary Planning Time will discuss potential modification of Section V-I-1-d, Early Monday Release and Section V-P, Planning Time. MTI’s appointees are: Nancy Curtin (Crestwood), Greg Vallee (Thoreau), Holly Hansen (Falk) and Doug Keillor. The Madison School District may discontinue its dual-language immersion program at Chavez Elementary because of a lack of Spanish-speaking families interested in the program. Superintendent Jane Belmore said Thursday the district is reviewing several options and no decisions have been made. Other district schools that offer dual-language classes, which provide instruction to native and non-native English speakers in a mix of Spanish and English, are not affected, she said. School Board president James Howard said the board already plans to review the program in coming months because of a shortage of Spanish-speaking teachers. The district’s program started at the Nuestro Mundo charter school in 2004. It has since expanded to Chavez, Glendale, Leopold, Midvale and Sandburg elementaries and Sennett Middle School, with plans to expand it to Lincoln Elementary and Cherokee, Sherman and Toki middle schools. What Wisconsin reveals about public workers and political power. The raucous Wisconsin debate over collective bargaining may be ugly at times, but it has been worth it for the splendid public education. For the first time in decades, Americans have been asked to look under the government hood at the causes of runaway spending. What they are discovering is the monopoly power of government unions that have long been on a collision course with taxpayers. Though it arrived in Madison first, this crack-up was inevitable. We first started running the nearby chart on the trends in public and private union membership many years ago. It documents the great transformation in the American labor movement over the latter decades of the 20th century. A movement once led by workers in private trades and manufacturing evolved into one dominated by public workers at all levels of government but especially in the states and cities. The trend is even starker if you go back a decade earlier. In 1960, 31.9% of the private work force belonged to a union, compared to only 10.8% of government workers. By 2010, the numbers had more than reversed, with 36.2% of public workers in unions but only 6.9% in the private economy. A school that has served pregnant and parenting students for decades in Milwaukee Public Schools is likely to be closed at the end of the year so the district can instead focus on serving child parents mainstreamed in schools across the district. Lady Pitts School, located in the lower level of Custer High School at 5075 N. Sherman Blvd., offers middle school and high school programming and has been a reprieve for teens during their transition to motherhood since 1966. But today, the majority of teen parents in MPS choose to stay in their home high schools, according to a recent district survey. And while some alternative schools for pregnant girls still exist around the country, the model has fallen out of favor in many other areas. School officials say that’s partly because teenage pregnancy is less stigmatized than it used to be. More important, some school systems have recognized that young parents’ academic needs are not always best served at a site sequestered from their traditional school. For more than a week, I’ve been trying to get the names of the people appointed to the East and West/Memorial task forces on attendance and facilities. I have the following partial list of the names of people who were nominated by board members and the board member who nominated each.